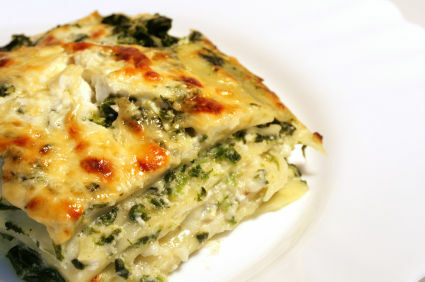 Do you love that spinach artichoke dip at restaurants? I think we all do. Why not put all those great flavors into a lasagna? Change up your lasagna routine with all the rich creamy comfort of the dip. This is a great recipe for family that is special enough for entertaining. You can roll the lasagna noodles into individual rolls if you like, but it’s a lot quicker to layer it. I guess it’s fancier served as rolls, but I am fine with the layered look. The linked recipe does not include spinach nor artichoke hearts, but the alfredo sauce just cries out for it in my opinion. Just thaw a package of frozen spinach in the microwave and squeeze out as much liquid as you can. Drain the artichoke hearts and mix the pieces along with the spinach into the alfredo sauce and follow the recipe the rest of the way. You could even mix the veggies, sauce, and cheese together. Then all you have to layer are the noodles, the chicken and, the sauce mixture. I’m all about speed in the kitchen. With all of the goodness and nutrition in the main dish, you can just add some raw veggies, like carrots and tomatoes, as a side for the family. For guests, you could do a salad with some tomatoes and olives on top for color. Breadsticks would be great too if you can work out the schedule with the lasagna in the oven. Great meal all around. Click here for the recipe at Mmmm Cafe. This would be wonderful during the holidays. You could even leave out the chicken for a great vegetarian version. The linked recipe includes a recipe for alfredo sauce and she says you can use alfredo sauce that comes in a jar to be quicker. Here is a recipe for Rich Creamy Alfredo Sauce that is quick and easy to make. Enjoy! anexactinglife, I had white pizza with spinach, artichokes, and chicken that was delicious. They added pieces of sun-dried tomatoes. They added even more flavor and it looked nice too. I think I’m going to add some to this lasagna sometimes. They would look good on top with some fresh spinach leaves for Christmas! 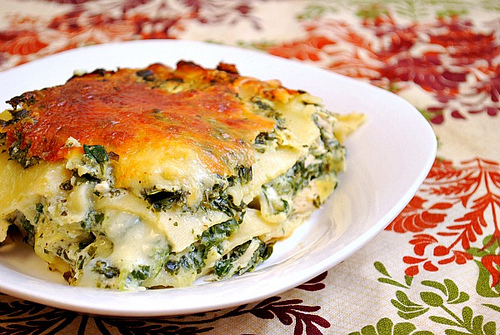 It never occurred to me to put artichoke hearts in lasagna; I definitely will try this! Hey, MC. I have to agree. Will be making this soon! “This would be wonderful during the holidays” – I beg to differ – this would be wonderful any day! Thanks, Janine. I’m thinking this would be great for houseguests too. Enjoy! Looks like a great recipe! Can’t wait to give it a try !!! !